The HAL 9000 is ready to take on Dave again. 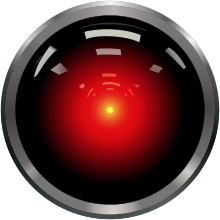 Back in 2001, somewhere in space, HAL (Heuristically-programmed ALgorithmic computer) locked the pod bay doors of Dave’s space ship, Discovery One, and wouldn’t let him in. Dave has since been looking for a rematch and finally got it. He will go head to red with HAL in a battle of wits tomorrow night in some other place in space. A live feed of the match-up will be available at WhatAreYouDoingDave.mon. Wicked Witch Convention all weekend; B.Y.O.S.